Great for door-to-door campaigning to let people know you stopped by! 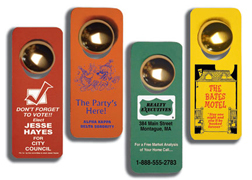 Print your name and message on these 3-1/8″ by 8-1/8″ door knob hangers. These are printed on either white tag stock or .015″ rigid white vinyl. Choose from several different designs. An additional $20 non-refundable artwork layout charge must be paid before work can begin on the knob hangers. For logos and other artwork, add an additional $25. Also available are Door Knob Hangers with Removable Card or Magnetic Backing. Call 321-253-0424 for pricing. Our durable rubber door hangers double as a jar opener. 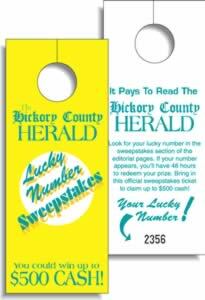 Door hangers are 4″ x 9-1/4″ with an imprint area of 3-1/4″ x 5″. An additional $40 non-refundable artwork layout charge (per custom imprint color) must be paid before work can begin. Bulk packaged. Black, reflex blue, red, green and burgundy. White ink available on dark rubber colors. We offer PMS color match as close as possible for our rubber jar opener door hangers at no extra charge.